It is a truly delight to join you at today's reception to mark the premiere of Richard III performed by the National Theatre of China. I want to extend my warmest welcome and thanks to the artists from China. They came all the way to London to bring us the wonderful Chinese version of this great British classic. In my view, three things have made the Chinese production of Richard III special and outstanding. First, this 15th century king became a recent sensation in the UK. The discovery of his lost remains under a car park in 2012 created headlines around the world. The interest continued with proof from DNA identification. Then there was his reburial in Leicester Cathedral last March. Throughout there has been much talk about his life and achievements. This unintended coincidence and the recent interest have certainly raised the expectations for the Chinese National Theatre's rendition of Richard III. The second point I want to make is that the Chinese version of Richard III is not merely another translation of Shakespeare's writing. It is imbued with Chinese appreciation of the original work. The adaptation by director Wang Xiaoying of the National Theatre of China incorporates elements of traditional Chinese culture. The performance is in Chinese and intends to convey the Chinese understanding of Shakespeare and his play. This is without doubt a great feat of innovation resulting from China-UK cultural exchanges. It is an excellent display of how the Chinese and British culture work together seamlessly in one play. It is the best birthday gift from Chinese artists for next year's 400th anniversary of the great playwright. · There will be 66 individual events or projects. 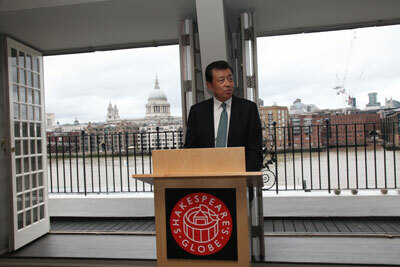 · The British public will be treated to a feast of classic, modern and contemporary art works and creations from China. These events of the China Season will surely bring China-UK cultural exchange and cooperation to a new and higher level. So, with the above three points, I am happy to say, for the National Theatre of China to bring their production of Richard III to the UK, there is no better time than this. In conclusion, I wish the performance a great success! And I wish everyone an enjoyable evening!